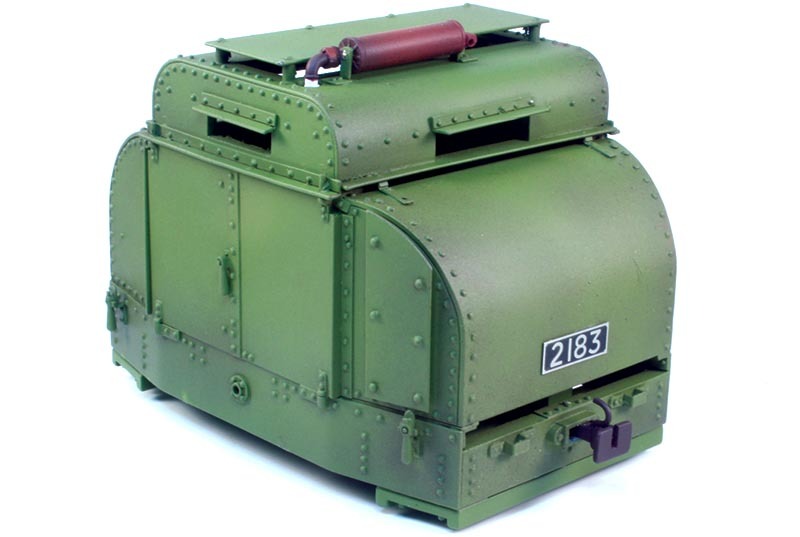 Swift Sixteen offers 16 mm scale, cast resin kits for Armored Simplex locomotives (See November/December 2008 GAZETTE). They are available in either 32 mm or 45 mm gauge, and sell for £200.00. The prototype locomotives were gasoline powered, ran on 60 cm gauge track, and were used to haul trains to the trenches during World War I. They were built by England’s Rail Motor Company, and were commonly known as Simplex tractors due to their robust and reliable two-speed Simplex transmissions. These small locomotives were built in 20 hp and 40 hp versions, and many of the 40 hp versions were armored to protect the drivers. These resembled a small tank, and were called “Tin Turtles” by the troops. The Swift Sixteen kit includes remarkably clean resin castings, a sheet of photo-etched parts, brass investment castings for the couplers and door handles, along with a fully assembled power chassis. In addition a selection of brass pins, metal clips and brass rod is included. Two large resin castings for the under frame and superstructure form the basis on which all of the details are applied. All the resin parts have a minimum of flash, and will clean up with a sharp knife, fine sand paper, and some files. I found assembling my Tin Turtle straightforward and remarkably fast. I had my kit completed to the primer and paint stage in four hours. While instructions are not included with the kit, a full set of illustrated PDF directions is available on the Swift Sixteen web site. The heart of the model is the fully assembled power chassis powered by a 380-type, 12-volt DC can motor. The drive train features a worm and spur gear driving one axle, with power provided to the second axle through cog gears and a delrin chain. These chassis are available in either 32 mm or 45 mm gauge, with either 13:1 or 25:1 gearing. The 13:1 gearing gives a higher top speed, and is less expensive; however, it does require regular adjustment to keep the worm and spur gear in alignment, and is somewhat less durable. The 25:1 ratio provides lower top end speed, better tractive effort, and is more durable, but costs a few dollars more. Since the prototype was capable of a blistering 12.5 miles per hour in high gear, I recommend the 25:1 gearing. This power chassis, along with several others is available separately from Swift Sixteen if you are looking for a reliable, smooth running, moderately priced, mechanism. The choice of power and control is left up to the modeler. Track wipers will have to be added if you use track power, or you can add a radio control battery system. 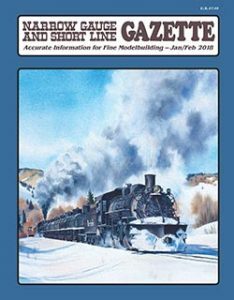 This review appeared in the January/February 2018 issue of Narrow Gauge & Short Line Gazette.